How will I know it is God's voice and not my conscience? This is an interesting question to me because I was raised to believe that one's conscience had to be trained by God and one of the ways God spoke was through the conscience. Let's take a look at a story in John's gospel chapter eight. Apparently these religious leaders had caught this woman in some sort of adulterous activity. They brought her to Jesus hoping to trap Him. They probably knew that He'd be more lenient with her than their law commanded and they might be able to accuse Him of violating Moses' law. No doubt they were surprised at His answer. It was a reply that caused them to turn their attention inward to the extent that the outward situation they had created was no longer an issue or concern. Jesus' statement engaged their individual consciences, they were convicted thereby and one by one they left the scene. What happened here? It appears that the words of Jesus activated the conscience of each accuser. The conscience of each one changed their direction that day. It is important to note what conscience is. Let's look at a definition. Conscience is an aptitude, faculty or judgment of the intellect that distinguishes whether one's prospective actions are right or wrong by reference to norms (principles or rules) or values. In this scripture conscience was self judgment or self condemnation. According to their own customs and laws they were sinners and therefore unfit to throw a stone at another. They had not realized it until God's word shone upon their hearts. Had Jesus not been there that day that woman would have died. It would have been perfectly legal and right according to the law of the day. Their collective conscience would have been clear on the issue. Jesus' words produced a new perspective to old programming. Conscience is based on learned rules and values that are accepted by our culture and society. God's voice is pure truth - free of all cultural and societal encumbrances. Following conscience alone we can only repeat what our fathers have done - that's what those religious leaders were doing. 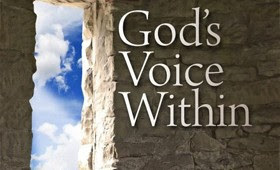 God's voice activating a new perspective within our conscience will produce new and different behavior. God's voice will always point our view inward. God's word won't judge us or anyone else. Where did the judgment come from in this story? Conscience. Conscience judges and condemns us either to do or not to do some deed. I wonder what would have happened if those Pharisees had stayed to hear Jesus speak to the woman? What would they have done when they heard his words: "Neither do I condemn thee: go, and sin no more." Those words are words of life. They left to suffer their own condemnation not hearing the freedom giving words of Jesus - words that would have applied to them just as well as to the accused woman. As we learn the distinctions between conscience and God's voice we can discern which is which. Perhaps the greatest distinction is that God's voice always leads us to life and freedom. Conscience without God's voice leads to judgment, condemnation, guilt and shame.